The Venice Eau de Parfum captures the experience of an early morning ferry journey towards the shores of Venice. With touches of sand, sea breeze and water accords, it is the perfect interpretation of a windy morning. The lagoon seems to envelop the city of Venice in a glittering glass globe, a magical sight that implies that the ancient place is all at once sinking and surfacing. Notes of Sea Breeze Salt, Bergamot, Peony, Sand Accord, Sandalwood and Patchouli make for a captivating floral-wood-musk scent that is perfect for the summer. The Rome Eau de Parfum is a serene and warm scent that captures both the history and the magic of the ancient city. The fragrance represents the meeting between the past and the present, a resonating scent that evokes the onset of dusk in the Belvedere of Villa Borghese. Notes of Bergamot, Tangerine and Iris evoke the sunny and welcoming nature of Roma, while contrasting Rum, Incense, Cedarwood and Patchouli incite mystery and piety. An icy scent with an unusual accord of Cold Blend, the Cortina Eau de Parfum explores the frosty landscape of Cortina at the height of winter. The intimacy of snowy mountains, with the romance and warmth of an afternoon spent in a suite at the Hotel Cristallo, a refuge from the swirling winds and the bracing winter air. Deeply floral notes of Ivy, Violet, Magnolia and Rose heighten the romance, while icy touches of Cold Blend and Musk reveal an intense freshness. The Sicily Eau de Parfum is a beautiful mineral-based scent that is bathed in late morning sunshine. A springtime scent with a wonderful character, it presents both the dreamy sky and the ancient earth in a casade of luminous notes. It conveys the contact between body and stone, and is set against the lightness of thoughts. 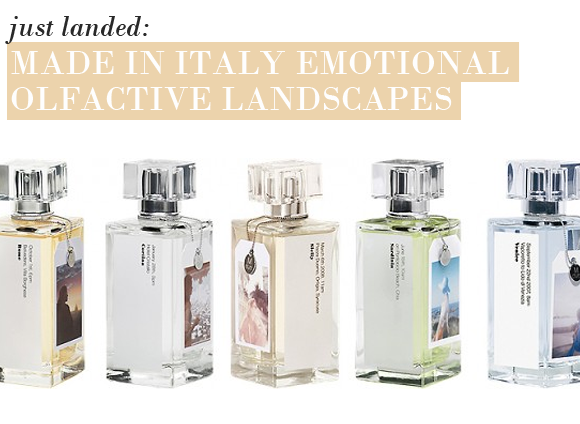 Notes include Neroli, Freesia and Jasmine, with unexpected touches of Hay and Cedarwood in the heart. An earthy drydown of Mineral Amber, Patchouli, Agarwood and Myrrh make for a hypnotic floral-woody scent. The fresh and green Sardinia Eau de Parfum is inspired by a day at the beach at the dawn of summer, a mosaic of soft colours and shapes characterised by unique and unexpected notes. The reassuring calm of the sun-warmed sea; the tonifying effect of the gentle breeze and the salty air; the serenity of the space between the sun and the sand. A scent that celebrates the natural landscape of being a child. Notes of Cedarwood, Tea Leaves, Honeysuckle, Broom, and Cedarwood make up this light and bright fragrance, invoking a sense of serenity. This entry was posted on Wednesday, July 13th, 2011 at 8:00 am and is filed under Fragrance, New products. You can follow any responses to this entry through the RSS 2.0 feed. You can skip to the end and leave a response. Pinging is currently not allowed. They really are something special. My brother is getting married in Italy next year, and I can’t think of a better gift!